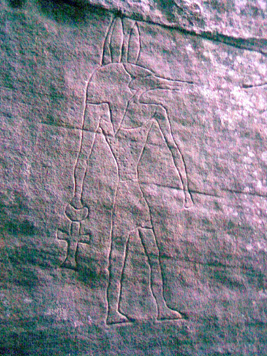 On 04 July 2007 my family and I explored the National Parks and environs around Gosford and located the Hieroglyphics in that area. I have no idea as to the true origins of these glyphs, other than; They are there!!! Click on below photos for larger view. GG1.1 - Gosford - taken 04/07/2007 at 10:34 am. Sad but True. GG1.2 - Gosford - taken 04/07/2007 at 1:20 pm. GG1.3 - Gosford - taken 04/07/2007 at 1:20 pm. GG1.4 - Gosford - taken 04/07/2007 at 1:21 pm. GG1.5 - Gosford - taken 04/07/2007 at 1:22 pm. GG1.6 - Gosford - taken 04/07/2007 at 1:22 pm. GG1.7 - Gosford - taken 04/07/2007 at 1:22 pm. GG1.8 - Gosford - taken 04/07/2007 at 1:22 pm..
GG1.9 - Gosford - taken 04/07/2007 at 1:22 pm. GG1.10 - Gosford - taken 04/07/2007 at 1:24 pm..
GG1.11 - Gosford - taken 04/07/2007 at 1:24 pm. GG1.12 - Gosford - taken 04/07/2007 at 1:24 pm. GG1.13 - Gosford - taken 04/07/2007 at 1:25 pm. GG1.14 - Gosford - taken 04/07/2007 at 1:27 pm. GG1.15 - Gosford - taken 04/07/2007 at 1:28 pm.